Hardwood Knocks is joined by NBA Math's own Adam Spinella (@Spinella14) to talk about the futures of the Raptors and Thunder, along with potential trades and Paul George's free agency. We also spend time tackling the pivotal Game 5 matchup between the Sixers and Celtics; reacting to the Hornets hiring Spurs assistant James Borrego; and diving into takeaways from David Fizdale's introductory presser with the Knicks. 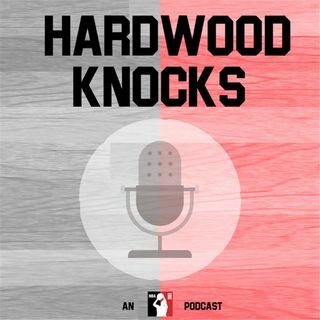 As always, be sure to subscribe to and rate Hardwood Knocks on ... Maggiori informazioni iTunes. You can also find us on Stitcher and BlogTalkRadio, and anywhere else you consume your podcasts. And as 50 Cent's biopic suggests: Follow Andy Bailey (@AndrewDBailey), Dan Favale (@danfavale), the show (@HardwoodKnocks) and NBA Math (@NBA_Math) on Twitter or die trying.